The SMK B2 air rifle is probably the best selling air rifle available in the UK. It offers superb value for money and is the cheapest way of joining the sport of shooting than any other. A excellent first choice air rifle with a simple no nonsense design. Full length stock with barrel locking lever and an adjustable rear sight. It has a grooved action so a telescopic sight can be fitted. Light weight, mid-sized air rifle suitable for junior shooters. The synthetic stock is popular with many younger shooters who prefer a more modern look to their air gun. It has an automatic easy to use thumb safety catch. This air rifle comes complete with fibre optic front and rear sights which are a big leap forward compared to the traditional open sights. SMK XS12 air rifle. This mid-sized air rifle is ideal for the younger shooter. Scaled down in size, but not in features, this beautifully engineered rifle will make any starting sportsman into a proud owner. The XS12 has an adjustable rear sight and is grooved for a telescopic sight. The rifle stock is fitted with a rubber recoil pad and has a comfortable cheekpiece. The new DB5 Custom from SMK offers unbeatable power for such a small amount of money. This is a development from the long running DB4 under-lever. It now has a longer action and improved transfer port for more power. The new Custom chequered hardwood stock means a low price does not have to look cheap. Kral Devil break barrel air rifle. Full power, light weight with high visibility fibre optic sights. This version has the synthetic stock in black but it is also available in Mossy Oak camo, Duck Blind camo along with a carbon fibre effect finish or even a synthetic thumbhole stock which is called the Champion. 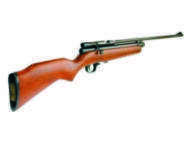 SMK XS78 co2 air rifle. Bolt action CO2 powered single shot sporter. Ambidextrous stock, adjustable single stage trigger with manual safety. Supplied with fully adjustable rear sight, Grooved for use with a telescopic sight. Powered by two CO2 capsules (2 x 12g) for recoilless hunting power. Light weight and compact, equally suitable for younger shooters and adults. Please note this air rifle has an ambidextrous stock but the bolt action is on the right so left handed shooters may find loading difficult. SMK XS19 break barrel air rifle. Full size air rifle with 43cm rifled barrel in .177 or .22 caliber. Adjustable rear sight and hooded front sight. It has grooves for use with a telescopic sight. The hardwood stock nicely finished and is fitted with a recoil pad. It is suitable for either left or right handed use. The action has a rich deep polished blued finish. 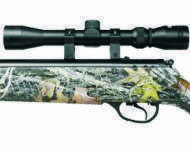 This rifle has a manual safety and is suitable for serious hunters demanding maximum power and accuracy. Also available as a complete package, see all of our air rifle packages. Kral Devil break barrel air rifle package, just £144.99. Includes Kral Devil .22 full power break barrel air rifle with a 4x32 scope with mounts and gun slip. Everything you need in one great package, unbeatable value. 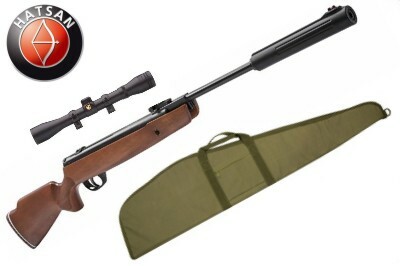 Hatsan 900x break barrel air rifle package, just £144.99. 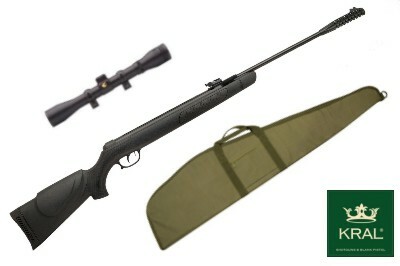 Includes Hatsan Breaker 900x .22 full power break barrel air rifle with a 4x32 scope with mounts and gun slip. Everything you need in one great package, unbeatable value. Kral Devil break barrel air rifle. Full power, light weight synthetic stock finished in Mossy Oak camo. High visibility fibre optic open sights, ventilated recoil pad, scope rails. Two stage trigger, manual safty and a smooth easy cocking action. This air rifle is available in other finishes, see the full range of Kral air rifles. SMK Th208 break barrel air rifle with superbly crafted thumbhole stock. Full size, full power hunting rifle with automatic safty. The barrel weight aids cocking but requies a scope to be fitted as this air rifle has no open sights. 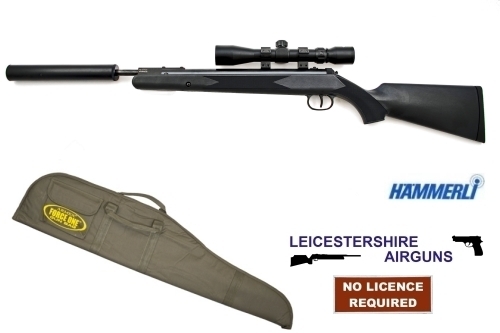 Hammerli Black Out break barrel air rifle package, just £179.99. Includes Hammerli Black Force .22 full power break barrel air rifle with carbine barrel fitted with the Back Draft silencer and a 3-9x40 scope with mounts and gun slip. Everything you need in one great package, unbeatable value. 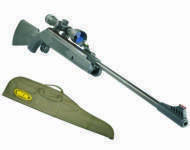 Hammerli Seeker break barrel air rifle package. Includes 3-9x40 scope, scope mounts, efficient backdraft silencer and gun slip. Cheap air rifle for sale. cheap air rifles available from Leicestershire Airguns. We sell the cheapest air rifles in Leicestershire. 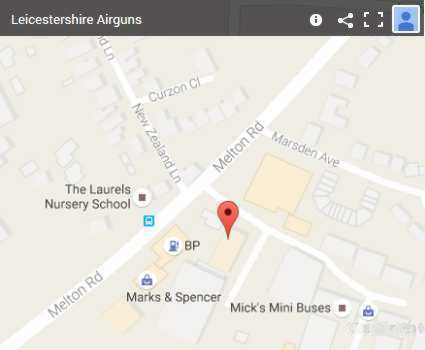 Leicestershire Airguns the cheapest place to buy air rifles.